James Neiss/staff photographerNiagara Falls, NY - Bishop William Franklin took the last position in a parade on Old Falls Street of participants from the Episcopal Diocese, lead by the Niagara Falls High School Marching Band. 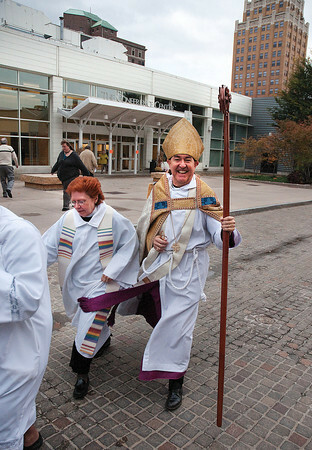 More than 325 clergy and elected lay delegates from 58 Episcopal churches across Western New York met at the Niagara Falls Conference and Event Center on Friday and Saturday for their 176th Annual Diocesan Convention. The theme of the Convention, "Unabashedly Episcopalian & On the Move," borrows it's focus in part from a book written by Bishop Andrew Doyle of the Diocese of Texas. The book is titled Unabashedly Episcopalian. Delegates read the book in preparation for this meeting.